Meet Aqua (MAN!!) Morris. 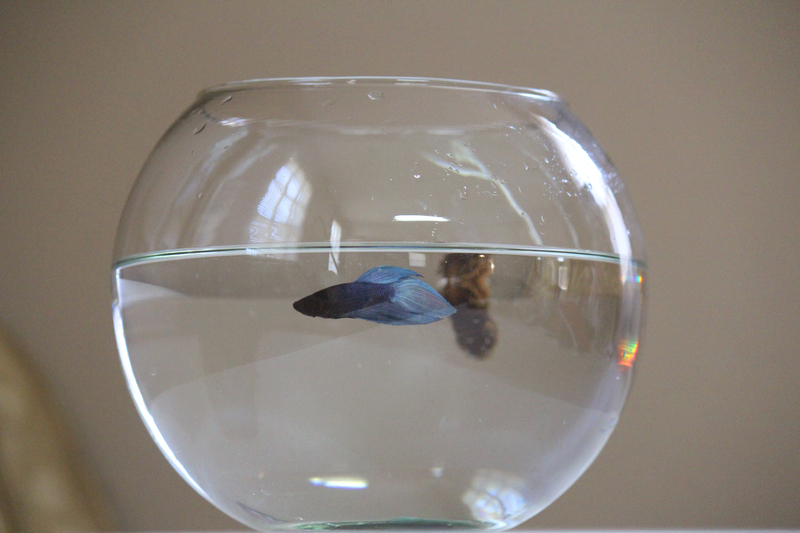 This blue male Veiltail Betta is the newest creature to join my household. My mom bought the little guy for me and I couldn’t be happier. I think Izzie likes him too, although not the attention I have given the fish! Blue Veiltail Bettas are native to southeast Asia — Cambodia, Thailand — and are also known as Siamese Fighting Fish, Combattant (in Canada), Trey Kroem phloek (in Cambodia) and Ca lia thia (in Vietnam), according to Petco, which is where I bought my little guy from. The fish can get to be 3″ in their adult size and are easy to care for. One neat fact: Veiltail Bettas can breath through their gills like other fish as well as from the surface through modified gills (labyrinth organ). I’m not a big fish person — I love the interaction that fish usually doesn’t provide. However, Aqua is definitely settling in (with me screaming Aqua Man!! each time I enter the door.) Plus, I’ve bought the bulbs that are supposed to grow into plants — hopefully — and I keep checking for signs of life from it.